Our Infrared SaunaPods feature dual-detox benefits and offer the full spectrum of infrared rays (near, mid, and far infrared). Most other saunas in Los Angeles only offer far infrared, or none at all.When visiting SaunaBar, you can be sure you’re investing your time and resources wisely. It’s the most beneficial relaxation treatment you can do for your entire well-being. your skin, appearance, and overall well-being. what makes our saunapod different? Traditional saunas in Los Angeles only heat the air around you, rather than the body directly. The temperatures often range from 180-220 degrees and most people cannot stand this “outside heat” for a long period of time, especially when their head is enclosed inside the sauna chamber. They tend to feel an intense drying effect. Luxurious, private pod lined with 440 Jade stones - known for their healing properties. “I have only done the Infrared Pod so that’s all I can really comment on. It’s amazing! I’m a huge fan of detox, sweating, infrared technology, and saunas. You will feel SO refreshed after using the pod. Your skin will glow and you will feel a boost in your immune system. “I cannot say enough good things about their Infrared SaunaPods. I’ve been using them for two months now and am kind of obsessed. I like to detox with the infrared beds about 3 times per week. Each and every time I can feel my stress disappear — It’s like nothing else I’ve ever experienced! What do I do after my session? STAY HYDRATED! Your body has just released heavy toxins and build up along with water. It is important to replace the water you lost, and in addition, drinking water after your session will help flush out any leftover toxins that need to be released. You may feel hungry after your session – if you choose to grab a snack, we recommend eating as clean as possible. How often can I do the Infrared SaunaPod? Every day as long as you are hydrating! Most of our clients and members come 2-3 times a week for measurable (and visible) results. Come and get the glow, while feeling better, sleeping better, and rejuvenating your energy. Understand that the more often you do a sauna session the more you will need to hydrate. If you need help figuring out how often to do a sauna or set up a detox program, ask one of our staff members to make a game plan with you based on your individual health goals. We’re passionate and happy to help! Should I moisturize before coming? Can I use lotions or oils in the sauna? We recommend NOT using any skincare products on your body before using any of our services. During your sessions, you are trying to release toxins through your skin, so putting on topical products may interfere with this process. Should I eat before going in the sauna? It is recommended that you wait to eat 1-2 hours before entering the sauna, and drink as much water as possible before your session. However, if you’ve eaten something, it’s not going to hurt you – your body will just be digesting and detoxing at the same time. Is someone in the SaunaPod with me? Nope, these are individual pods that each have their own private room. We do have a room where there are two pods, but doubles can only be booked by request through the front desk. Doubles are great for a spa day with a friend, partner or family member. I’m claustrophobic… will I like this? First things first – know that you are not alone. If you have had a hard time with traditional saunas due to being claustrophobic, then the SaunaPod may be the answer for you. While your body is in the Pod, your head will be outside breathing fresh air. You also have the ability to open and close the Pod at any time by simply pushing up or down – it can even be propped slightly open for you if need be. If at any time you feel anxious or want to get out, simply push the pod open or press the call button and a staff member will come help you. Many clients who are initially nervous about being claustrophobic come in and end up absolutely loving our SaunaPods! I don’t tolerate heat well. Does that mean I can’t do infrared? Don’t worry, we can customize a temperature just for you! If the heat makes you nervous, let a staff member know and we will not only set your sauna on a lower temperature but we will also stay to tuck you in and check on you throughout your session if need be. For a more relaxing, meditative sauna experience, ask to be placed on a 40℃ -45℃ setting. Rather than sweating too much you will feel warm and cozy, falling into a wonderful nap while still reaping all the benefits of our amazing infrared technology! How much will I sweat? It is different for everyone, which is why the heat is customizable. Some clients prefer not to sweat too much while others prefer their saunas extra hot so they sweat no matter what. Because your core is the first thing to be heated you most likely will not sweat until the last 10 – 15 minutes of your session. THAT IS GOOD! Heating from the inside out allows for a deep, thorough detox. If it is your first time you may not sweat at all or just very little. All that means is that your body takes a little longer to release toxins, but by your 2nd or 3rd session we promise you will get a decent sweat! Our Sauna Pods are 100% customizable, so that’s up to you! Reaching up to 75℃ our pods have a “perfect” temperature for everyone. We start everyone out at 50℃ (122℉), which is most comfortable yet still yields massive detox results. Because your body is heated from the core outward and your head is sticking out breathing fresh air, the temperature doesn’t really become noticeable or feel to “too hot” until the last 10 minutes of your session. This allows for a meditative, enjoyable, relaxing experience – which can’t be said for many other saunas. What wavelengths of Infrared do you use and what are their benefits? We use all three wavelengths of Infrared (Near, Mid, and Far) – all which each have different healing benefits! 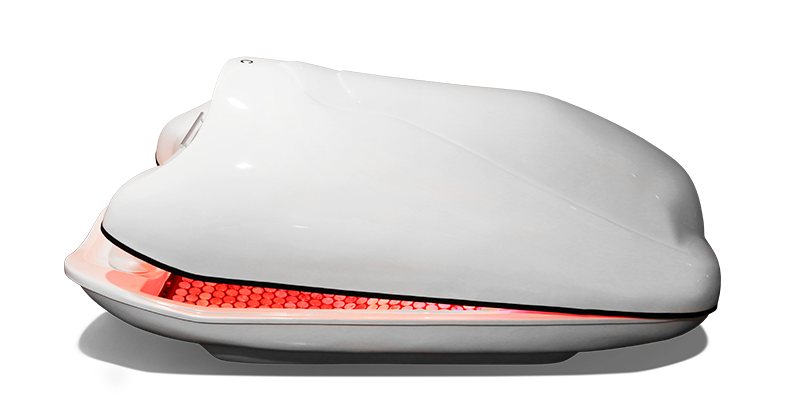 Near Infrared – Lining the top of our pods are large red light bulbs, these are the near infrared lights! 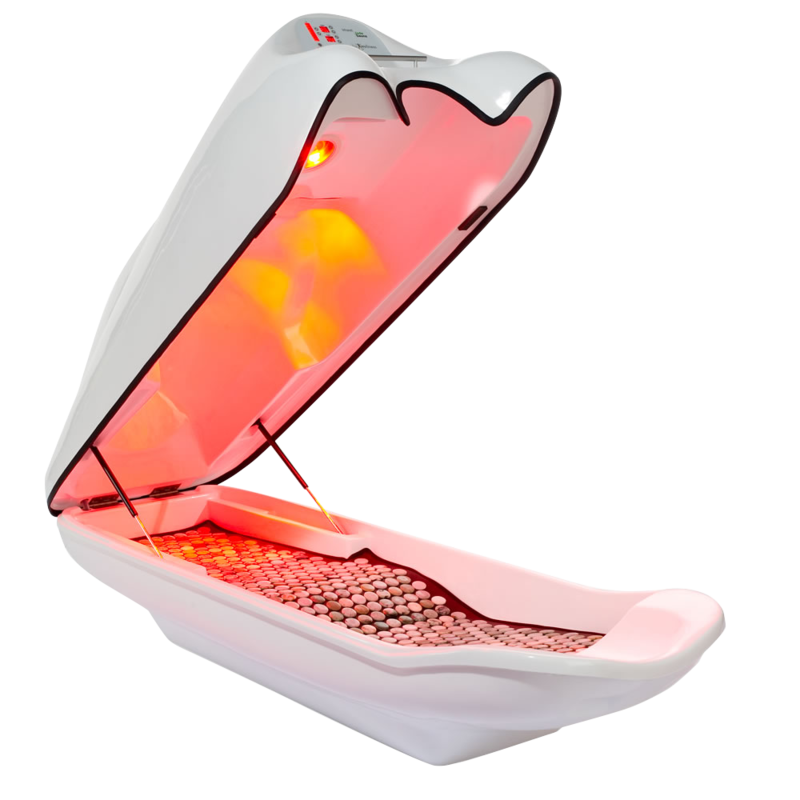 Near Infrared (Red Light Therapy) rejuvenates skin, promotes healthy cell regeneration, increases energy, reduces inflammation, improves circulation, and so much more! Far Infrared – Lying beneath you under the jade stones is the far infrared heating pad! This is an essential ingredient for a deep relaxing detox. The far infrared heats your core first, helping to float toxins, bacteria, and heavy metals to the surface where you will sweat them out of your skin in the last 10-15 minutes of your session. Just like near infrared, far infrared is also great for increasing your metabolic rate, reducing bloat, and burning some extra calories! Far Infrared Therapy also adds powerful cellular detox properties and helps with lymphatic cleansing. The combination of using both Near Infrared and Far Infrared rays in tandem creates the healing, meditative frequencies of Mid Infrared – a magical, euphoric feeling as you allow negativity and stress to leave your body! Must try it to believe it! Your actual Infrared Sauna Session is 40 minutes long, but your appointment time is blocked out for an hour in the room so you’ll have plenty of time to get in and out. This hour time slot allows for you to get in and out and take your time doing so. In addition, it allows for us to answer any questions you may have upon arrival. 30-40 minutes is standard to gain the full benefits from the infrared.